A Greek Salad is a wonderfully refreshing, light meal or side dish. 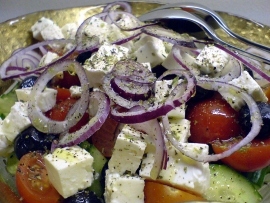 It mainly consists of slices or cubes of cucumber, cocktail tomatoes or sliced tomatoes, feta cheese, olives, red onions, green peppers and a Greek salad dressing. 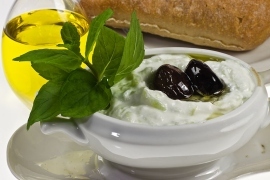 Dips are very popular in Greece and Tzatziki is one of the most famous ones and popular in many other countries. This dip is made from cucumber, garlic and yoghurt. 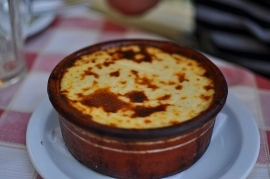 It is usually used as a side for meats, vegetables or as a dip for crusty bread. It can also be added to a Souvlaki. Speaking of Souvlaki: This is a very popular dish in Greece and very tasty indeed. It is often referred to as Greek's fast food though it is quite a bit healthier than a cheeseburger. 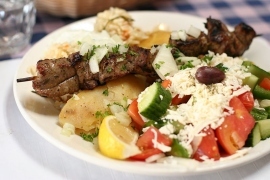 A Souvlaki is a skewer with grilled meats and vegetables (of your choice). You can either eat it right from the skewer or have it stuffed in a pita sandwich with some additional stuffings. A third option is to have everything arranged on a plate, then you usually also get some fries with it. Takeway Souvlaki restaurants also offer takeway platters. While there are different variations of this dish all over the Mediterranean region, the Greek version has proven rather popular. It is baked in the oven and the recipe can always be easily adjusted to a different number of guests. The ingredients are egg plant, mince (usually beef), pureed tomatoes, spices, some slices of potato, onion and garlic. This is then topped with a white bechamel sauce and a generous amount of cheese. 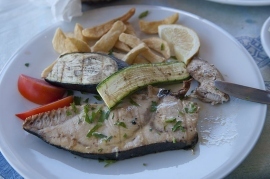 Fish and calamari are very popular in Greece, and the fresh fish taste fantastic, so they are usually prepared with a minimal amount of seasonings. Usually you get them whole (grilled or fried) with a little bit of lemon juice sprinkled on top. 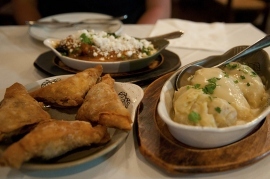 However, you can of course also go for a battered fish, and the Greek are no strangers to fish and chips either. This is a great dish for vegetarians, but of course also ideal as a side dish or snack for meat eaters. 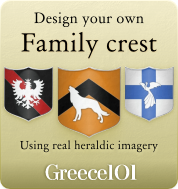 You can try to cook them yourselves, but for some reason you will never be able to copy the way Greek people make it. The balls are made by mixing grated courgettes with a variety of spices (and this mix is often kept quite secret).These balls are then fried and often served with Tzatziki. If you add a Greek salad, you have a fantastic light meal for a summer's day. The Greek make fantastic cheeses, the feta you can buy in supermarkets outside Greece are just a pale comparison to the taste you get from fresh Greek cheeses. And Tiropites are a great snack for tasting those cheeses. The different cheeses are wrapped in filo pastries and then fried. 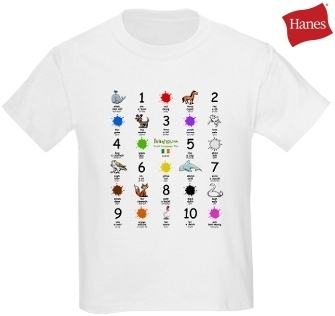 This is something for the people who love sweets. 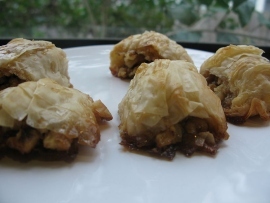 Baklava is very popular in Greece. 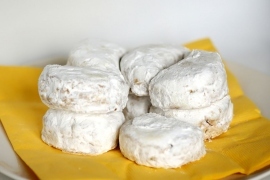 It is a pastry with a nut mix that usually has a nice cinnamon flavor and is very sweet. 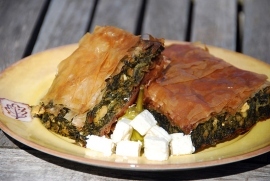 Pies can be found everywhere in Greece, and this pie is a favorite in Greece: the spinach pie. Fresh spinach builds the base for this pie and is topped with phyllo pastry. This is a very delicious meal, but messy to cook yourself, you will have a lot of washing up to do afterward. 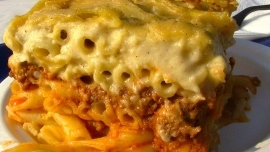 Pastitsio is baked in a dish in the oven and consists of three main layers: pasta, minced meat (usually beef or lamb) and a bechamel sauce topping. There are plenty of green leaf vegetables around in Greece, and the Greek love them. 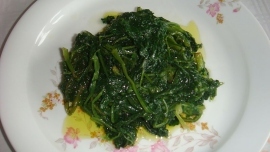 The Horta Vrasta is one example of a very fine vegetable dish. It is also rather simple: You boil leafy vegetables like spinach, chard or chicory and then simply season them to taste. Another sweet treat: This is a lovely Greek shortbread with a taste of almond. They are as rich as normal shortbreads but have a slightly lighter texture. 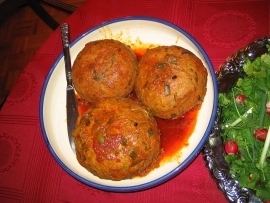 Keftethes are Greek meatballs and they are usually quite tangy. They are served as starters but can also be used as part of a bigger meal. Some of the ingredients are mint, mince and grated cheese. If you make them at home, you will be able to use seasonings depending on your own taste. The meatballs are very good with Tzatziki.